The Big Scare of 2009 is over, folks. The U.S. swine flu epidemic has ended. “The proportion of deaths attributed to pneumonia and influenza (P&I) was below the epidemic threshold,” according to the Centers for Disease Control and Prevention website Fluview and this chart shows it. New infections continued to drop this week to only 306 reported by CDC-monitored labs, compared to 1,370 just three weeks before and 11,470 at the height of the epidemic. That’s a plummet of over 97% from the height. Deaths and hospitalizations have plummeted to merely 20 and 313 respectively, compared to 85 and 982 just a week earlier and compared to 189 and 4,970 at the peak in October. Remember that according to CDC estimates, about 257 Americans die of seasonal flu per day during flu season. Mind you, the swine flu deaths are actual while the seasonal flu ones are estimates so it’s not a completely apples-to-apples comparison. Only 7 states still report widespread activity, down from 11 last week. The American College Health Association did not report new numbers this week, presumably because of the Christmas holiday. Repeat, the swine flu epidemic is over. So where do we go from here? No, unfortunately not to zero. Instead we’re at what’s called an “endemic” level. We can expect infections, hospitalizations, and deaths to continue at something the same rate as this last week until the end of flu season in April. Judging by what we’ve seen so far in the U.S. and the experiences in New Zealand and Australia, we are in for an extremely mild flu season overall. That’s because swine flu is more contagious than the far deadlier seasonal flu, essentially muscling it aside. People inoculated with swine flu infection don’t get the seasonal flu. So while you may recall all those “excess” deaths we were supposed to be getting from swine flu (30,000 to 90,000 according to the President’s Council of Advisors on Science and Technology and “89,000 to 207,000″ according to author John Barry in a The Washington Post op-ed that ThePost has now conveniently deleted but can still be read elsewhere, we will actually get far fewer flu deaths overall both worldwide and in the U.S. because of swine flu. 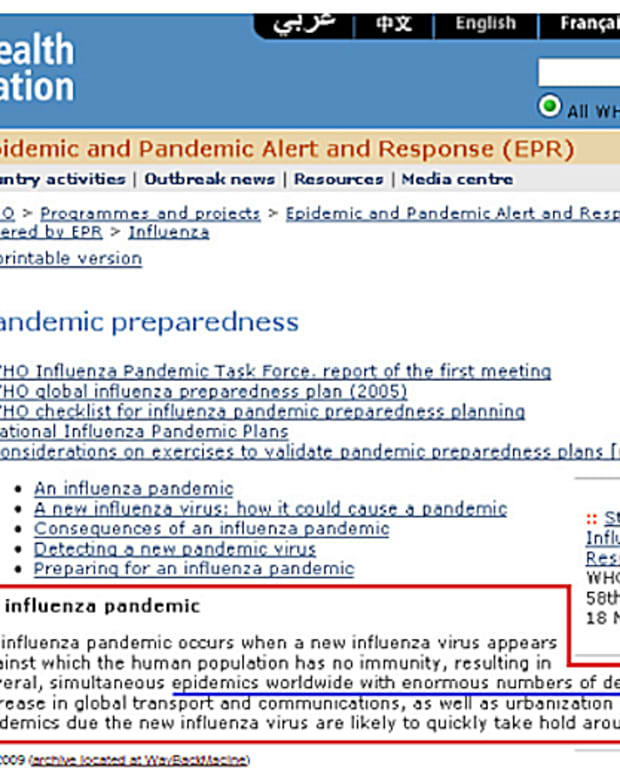 While the media are finally beginning to admit that the World Health Organization’s swine flu “pandemic,” made possible only by completely redefining the definition, may be the mildest in history, they are not willing to admit that we will actually have fewer flu deaths internationally because of this alleged pandemic. Yes, folks, the WHO and the media really did pull a fast one on us.